Bernard Parmalee was born September 16, 1967 in Jersey City. Bernie was a talented all-around athlete whose best sport was football. He was a wide receiver and defensive back for Lincoln High, and also lettered in baseball for the Lions. Despite his speed and size, Bernie was not recruited by top football programs. He accepted a scholarship from Ball State, and was moved to the running back position by coach Paul Schudel. The Cardinals were hurting at that position and Bernie showed enough to earn a starting job as a freshman. He led the team with 1,064 rushing yards and added 241 receiving yards, finishing with a total of 15 touchdowns. In 1988, Bernie split rushing duties with Mark Stevens as Ball State improved to 8–3 record. Bernie led the Cardinals in rushing as a junior and senior, finishing his college career as the school’s all-time leader with 3,483 yards. As a senior in 1990 he led the Mid-America Conference with 1,195 yards from scrimmage. Bernie went undrafted in the spring of 1991, but was offered tryouts by several teams who wanted to sign him as a free agent. He decided to sign with the Dolphins, but his agent rejected their offer without informing him. When he called the team, they offer had been withdrawn. So instead of playing 1991 in the NFL, he returned to his college stomping ground in Muncie and worked as a UPS driver and bowling alley clerk. In the spring of 1992, it looked as if Bernie would begin his pro career with the New England Blitz of the Arena League, but they folded and he was back on the street. Fortunately, the Dolphins invited him to camp that summer and he made the team as a jack of all trades. He bulked up 15 pounds to 205 and was a play-maker on special teams. In 1994, he earned a starting job in the Miami backfield and responded with 1,117 yards from scrimmage on 216 rushes and 34 catches. The Dolphins won the AFC East but lost to the Super Bowl-bound Chargers by a point in the second round of the playoffs. Bernie returned as a starter in 1995 and once again topped 1,000 all-purpose yards. 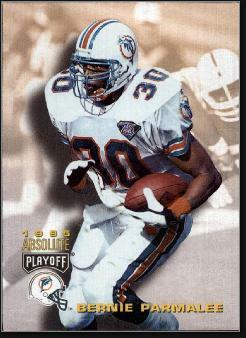 Bernie played a total of nine NFL seasons—seven with the Dolphins and his final two with the Jets. He continued to contribute as an occasional backfield starter, short-yardage receiver, special teams player and third-down specialist. After his playing days, he coached special teams for the Dolphins for three seasons before becoming the tight ends coach at Notre Dame. At South Bend he developed two Ditka Award finalists—Anthony Fasano and John Carlson—in five seasons. Bernie coached tight ends for the Kansas City Chiefs for three seasons before returning to college ball with Kansas University in 2014. His son, Tre, is a wide receiver for the Jayhawks.